Since the initial survey results were published in 1962, the outcomes have changed. The study showed that risk factors for coronary disease appear to be essentially the same in whites and blacks. But for all causes of death combined, there were higher rates among blacks than whites. The study also confirmed that high blood pressure, cigarette smoking and a history of diabetes were significant risk factors in all groups. While high cholesterol levels were found to be a risk factor among white men, white women and black women, no significant association could be made to cholesterol levels in black men as a predictor of death. 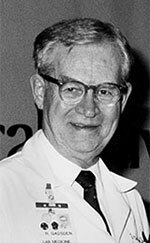 Edwin Boyle Jr., MD was born in Sumter, South Carolina, on September 27, 1923, to Edwin Boyle Sr. and Mary Alice Dickson Boyle. He received his bachelor’s degree from the University of North Carolina in 1943 before earning his medical degree from the Jefferson Medical College in Philadelphia in 1947. Between the years 1947 and 1951, Dr. Boyle held postdoctoral positions at institutions including Philadelphia General Hospital, Watts Hospital in Durham, North Carolina, and the University of Virginia in Charlottesville. From 1951 to 1955 he worked as a senior clinical investigator in the National Heart Institute’s Section on Metabolism at the National Institutes of Health. Prior to joining the MCSC, Dr. Boyle worked as an investigator for the American Heart Association. 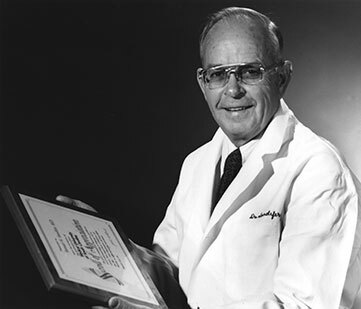 Dr. Boyle first joined MCSC in 1956 as director of the Lipid Metabolism Laboratory and instructor in medicine. He was promoted to associate in medicine in 1958 and was later appointed assistant professor of research medicine in 1964. 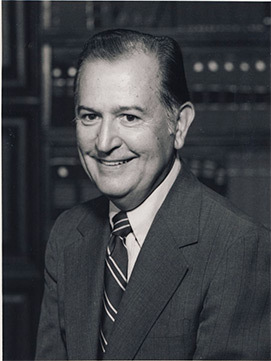 In 1966 Dr. Boyle became director of research for the Miami Heart Institute, a position he held until returning to MUSC in 1976. Upon rejoining MUSC, Dr. Boyle served as clinical professor of medicine in the Department of Medicine and directed a research program in aging. His early research centered on the study of cardiovascular diseases and the prevention of heart attacks, strokes, congestive heart failure, and hypertension. Dr. Boyle was internationally recognized for developing a method of measuring cholesterol and breaking it down into different types. He was also known for his role in promoting the use of heparin as a form of therapy for certain types of cholesterol related diseases. He was an expert in the fields of lipid metabolism and atherosclerosis before turning his attention to aging and the problems dealing with senility and memory loss. He maintained a strong interest in the sociological, cultural and psychological as well as the physiological and biochemical aspects of aging. One of Dr. Boyle’s most significant accomplishments was the establishment of the CHS that began in 1960. He died in an automobile accident on July 9, 1978. A self-contained mobile trailer unit, staffed by a registered nurse and a public health advisor, was used to contact and examine each potential subject at his/her place of residence. 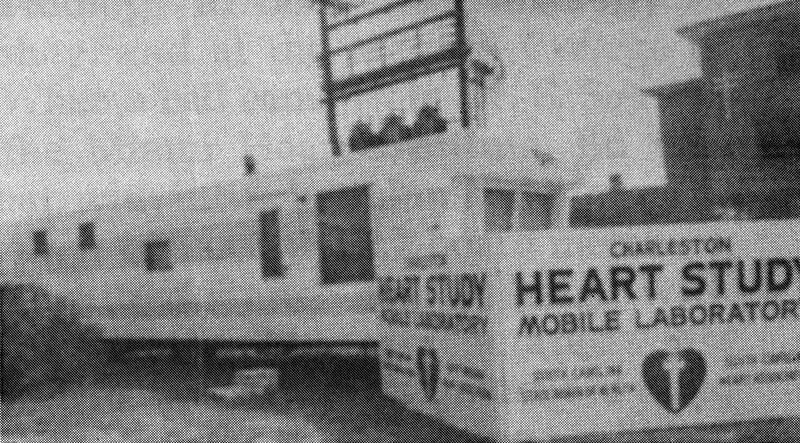 This was the first trailer used by Dr. Boyle, 1960. The “New Moon Trailer” went into use on August 14, 1962. Lola Engler, RN, a project nurse during the initial two years of field activity, recalled that the trailer was a one-bed bunk trailer with a kitchen sink, electric heat, a water supply and a small toilet. The trailer was often cold in the winter because the electric heat was not very satisfactory. She also recalled that as the trailer was taken around the various neighborhoods some Charlestonians objected to the trailer’s being parked on their street. An appointment card, along with an instruction sheet, was given to each participant at the time an appointment was made. 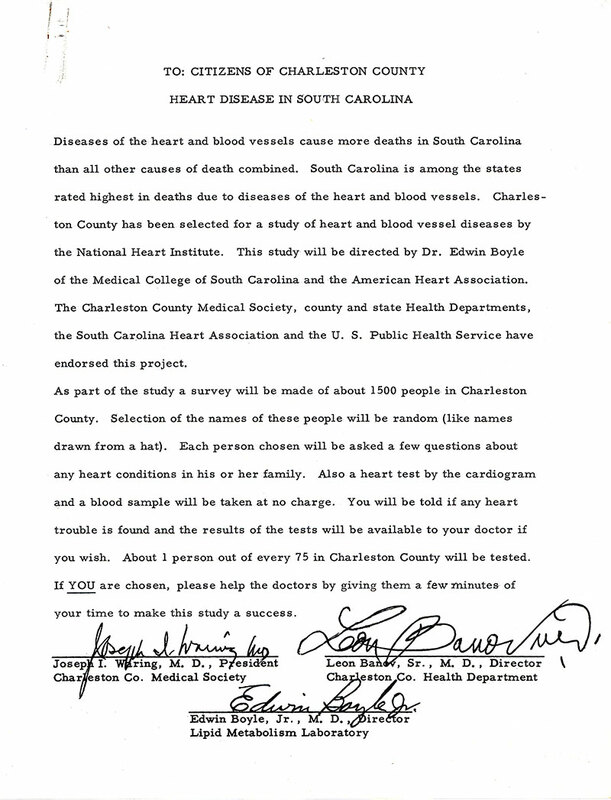 Using population data from the 1950 census, researchers designed a sampling method to select participants for the Charleston Heart Study. 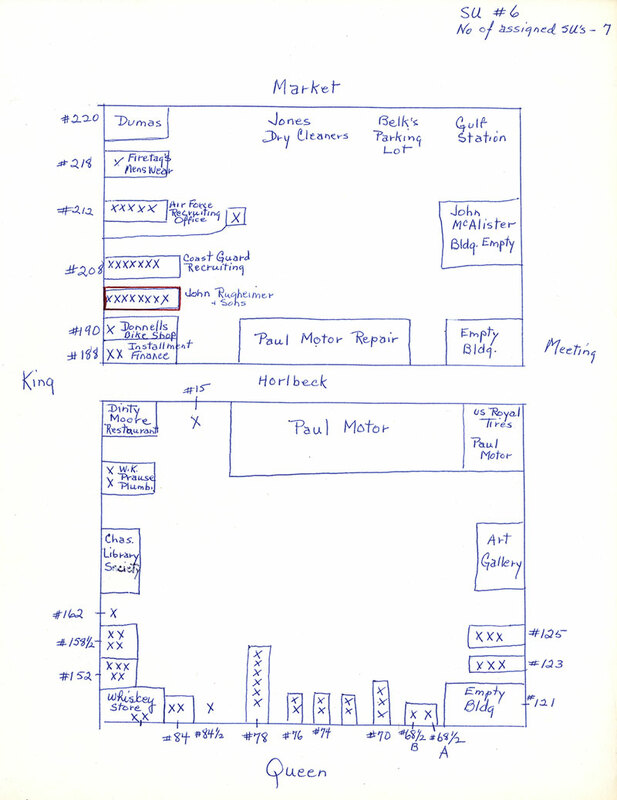 Selected blocks were visited and sketches prepared showing the locations of all dwelling units in each block. The block was then subdivided into appropriate sampling units and one of those sampling units was selected at random for the sample proper. Sixty-four blocks were selected. Samuel Hope Sandifer, MD was born on Mary 27, 1916, in Walterboro, South Carolina to Myron S. and Cornelia Hope Sandifer. He graduated from The Citadel in 1937 and earned his medical degree from the Medical College of the State of South Carolina in 1941. After completing an internship at Brooke General Hospital in San Antonio, Texas, Dr. Sandifer joined the U.S. Army Medical Corps and fought in World War II. In 1949 he completed his residency in internal medicine at the Medical College of Virginia before completing a cardiology residency at Fitzsimons General Hospital, Aurora, Colorado in 1955. During his twenty-four year career with the Army Medical Corps, Dr. Sandifer served as chief of the cardiology service and chief of the medicine department in various army hospitals and held fellowship positions with the American College of Physicians, the American College of Cardiology, and the American College of Preventive Medicine. Dr. Sandifer retired from the Army in 1965 with the rank of colonel and was awarded the Legion of Merit. That same year Dr. Sandifer became the first full-time physician to The Citadel Corps of Cadets. He joined the faculty of MUSC’s Department of Medicine in 1968 as associate clinical professor of medicine and preventive medicine before being promoted to professor of preventive medicine in Family Practice. He became chairman of the Preventive Medicine Section in 1973. He was made Emeritus Professor upon his retirement from MUSC in 1982. Dr. Sandifer died on March 22, 2001 in Charleston. Julian E. Keil, BS, MS, DrPH, FACC, a native of Charleston, received his bachelor and master degrees from Clemson University and a doctorate in Public Health from the University of North Carolina at Chapel Hill. He joined MUSC in 1983 where he devoted much of his career to cardiovascular research. Dr. Keil served as co-principal investigator and co-director of the Charleston Heart Study. Peter C. Gazes, MD was born October 10, 1921 in St. Matthews, South Carolina. He earned his bachelor of science degree from the College of Charleston in 1941 and his medical degree in 1944 from the Medical College of the State of South Carolina. Dr. Gazes joined the faculty of the Medical College in July 1950, becoming the first cardiologist in South Carolina. He rose quickly through academic and administrative ranks to professor of medicine and director of the Cardiovascular Division in 1967. He was appointed Distinguished Clinical University Professor of Cardiology in 1982. He is known as the father of cardiology in South Carolina. Dr. Gazes began his affiliation with the CHS starting in 1960 and went on to serve as a co-principal investigator and co-director. 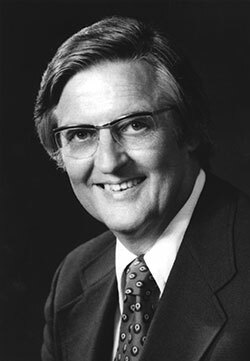 Richard H. Gadsden, PhD, was born on June 30, 1925 in Denver, Colorado. After earning his high school diploma in 1942 from Charleston High School, he enlisted in the U.S. Navy Hospital Corps in 1943 until being honorably discharged in 1946. He went on to graduate from the College of Charleston in 1950 and before earning both his master’s and PhD degrees in chemistry from the Medical College of South Carolina in 1952 and 1956 respectively. Dr. Gadsden joined the faculty of the Medical College in 1951 as a teaching fellow before being appointed instructor in chemistry in 1954. 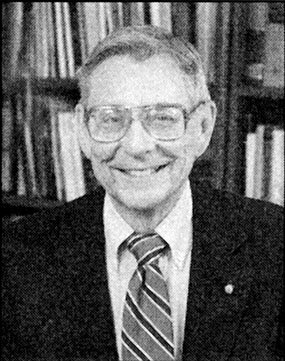 Over his fifty-year affiliation with MUSC, Dr. Gadsden held a number of positions including assistant professor of chemistry (1956-1965), associate professor of chemistry (1965-1970), and interim chairman of the Department of Chemistry (1967-1969). He also held professorship positions in biochemistry (1970-1990), clinical pathology (1970-1974), laboratory medicine (1974-1987), medical technology (1974-1992), biochemistry & molecular biology (1990-1992), and pathology & laboratory medicine (1987-1992). 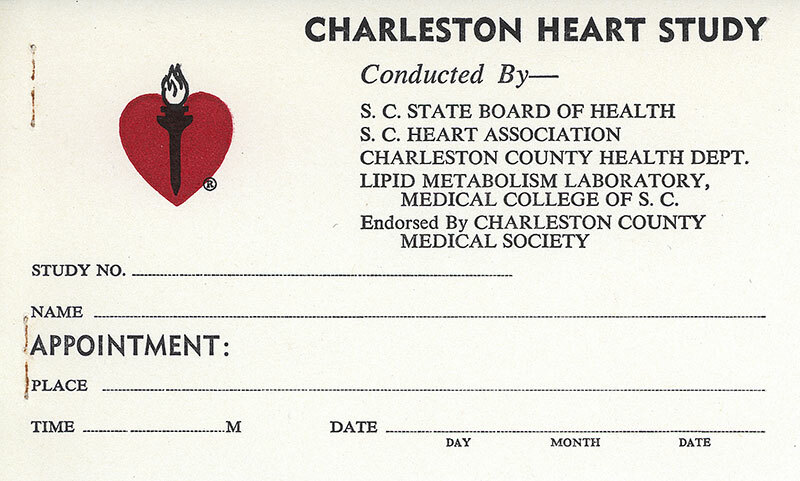 A biochemist, Dr. Gadsden served as a senior associate on the Charleston Heart Study beginning in 1973. Upon retiring in 1992, he was given the title of professor emeritus of biochemistry and pathology & laboratory medicine. In addition to his work at MUSC, Dr. Gadsden held leadership positions in numerous national and state professional organizations including the Association of Clinical Scientists and the American Association for Clinical Chemistry. Dr. Gadsden was a recipient of an honorary Doctor of Letters from the College of Charleston, as well as Alumnus of the Year. Dr. Gadsden died on December 25, 1997 at the age of 72. 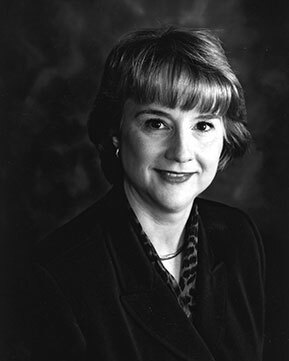 Susan E. Sutherland, PhD, received her bachelor of science in nursing (1978), master of science (1983) and PhD (1992) from the Medical University of South Carolina. 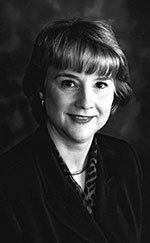 She joined the Charleston Heart Study team in 1983 and served in multiple positions including database manager, biostatistician, project manager, and principal investigator. Dr. Sutherland has served as director of the Research Institute at Mission Hospital in Asheville, North Carolina since 1998. 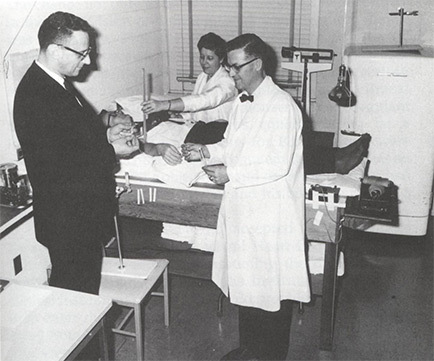 Lola Engler, RN and Dr. Edwin Boyle with a manufacturer’s representative for equipment being used in the study, circa 1960. Bernard G. Greenberg, PhD, earned a degree in experimental statistics from North Carolina State University in 1949. That same year he was appointed chair of the University of North Carolina-Chapel HIll's newly formed Department of Biostatistics. During his long association with UNC-Chapel Hill, Dr. Greenberg oversaw the establishment of several master's and doctoral programs in biostatistics, mental health, genetics, and environmental health. 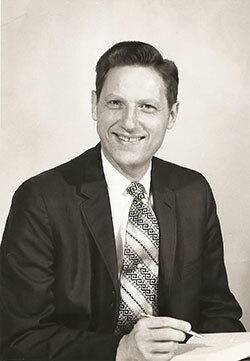 In 1972 Dr. Greenberg was appointed dean of the School of Public Health, a	position he held until 1982. Dr. Greenberg died in 1985. Dr. Greenberg helped design the randomized sampling method used to select the participants of the Charleston Heart Study.